Cheese/cutting boards are always a wonderful gift for others and yourself. They come in a variety of shapes and sizes. The boards are great for keeping your favorite appetizers chilled. Just put the board in the fridge for a few hours and take it out for serving. Larger cutting boards are great to have on the counter. Not only are they a working tool, but they look great too! ​Prices for our Michigan cheese/cutting boards are: $45 for the small, $60 for the medium and $80 for the large boards. 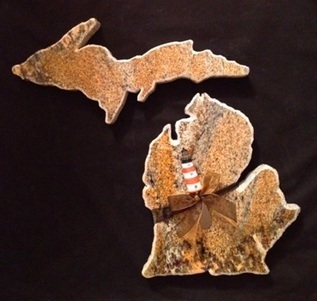 Our Michigan sets are $125 and $150. Our selection of other shapes vary in price. ​Check out our gallery to see our styles. Custom designs can also be made. Beautiful granite flowers are part of our signature line. Each flower is unique and can be mounted on one of our metal stems to plant in the ground. They come in a number of sizes, shapes and colors, and are a wonderful addition to any garden. One-of-a-kind bouquets can also be created to accent any decor. They can be used for both indoor and outdoor display. Some are even accented with a solar light. ​Our prices range from $20.00 to $35.00 for the individual flowers. Prices include a handcrafted metal stem. Our tabletop bouquets start at $75.00 and our floor bouquets start at $125.00. Memorial items are part of the unique pieces we design. In addition to carving the stone, we can sandblast an image, name, or message into the stone for a loved one. Beautiful hand-carved crosses and crucifixes are among our specialty items. They are ready to be hung on the wall for display both indoors and outdoors. Our crosses start at $50.00.